Ok, so I’m borrowing Cheryl Strayed’s title because: first, I love that book; and second, it seems increasingly important, now, to appreciate tiny beautiful things. In fact, I see it as a strong counterargument to the rising tide of fear-mongering propaganda. So much beauty in the world, all around us, every day – we simply have to take the time to notice, stop and smell the flowers, so to speak. 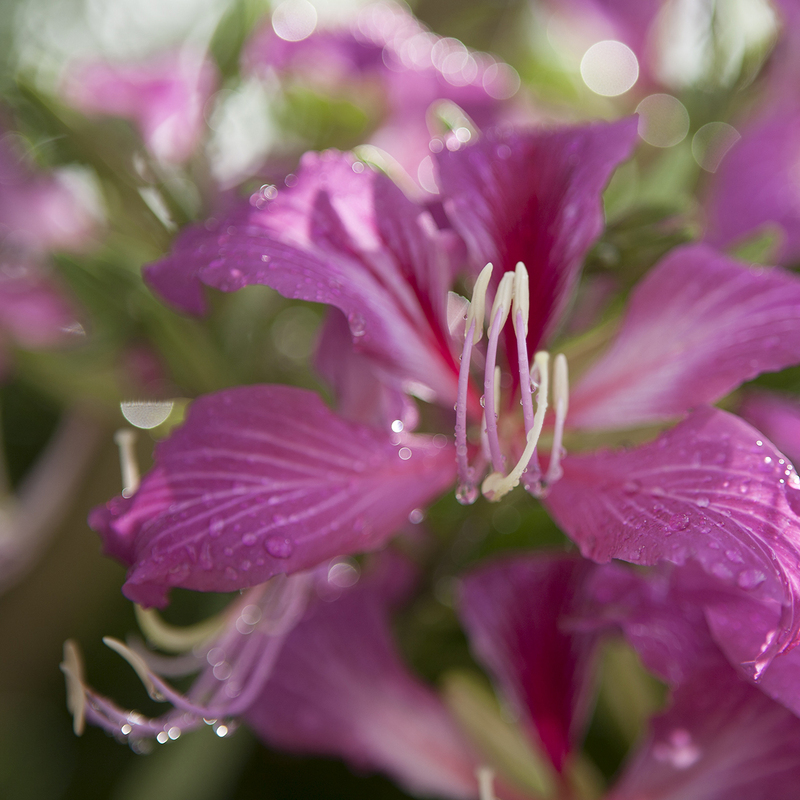 So here’s a dose of beauty for today… our Hong Kong Orchid tree, aka Bauhinia blakeana. We’re blessed to have this specimen in our backyard. Its flowers are orchid like, but bigger (five to six inches across), and successive flowers creep up each stem for a show that lasts months long. Here you ee a fraction of the tree, taken back in Decemeber when it first began flowering. The flowers emit a delicate sweet smell that attracts bees, butterflies, and this little friend just recently… which is undoubtedly a tiny beautiful thing. And if that’s not enough to warm your heart today, then note these two little critters, side by side, floating in our pool on one of the tree’s lilypad-like leaves after a heavy rain. It’s almost too much. Love you have hummingbirds there too. Great pictures and beautiful tree! Thanks Kim! We were pretty excited when we saw our first hummer here… made us feel like we’d landed in the right place. Lovely pictures, and text. I feel better. Are those little frogs, or baby Bufo toads. I love the frog twins or frog lovers. Beautiful! Loved Tiny Beautiful Things! Love this! Love you!